a homely charm that makes you somehow feel comfortable with the area. We stopped and took our bikes for a ride. I usually tie Harpo with a little leach to the bike. He likes to go full speed the first couple of miles and I really have to kick the pedals to keep up with him. We went along the St Andreas fault to Dana Point and back again. 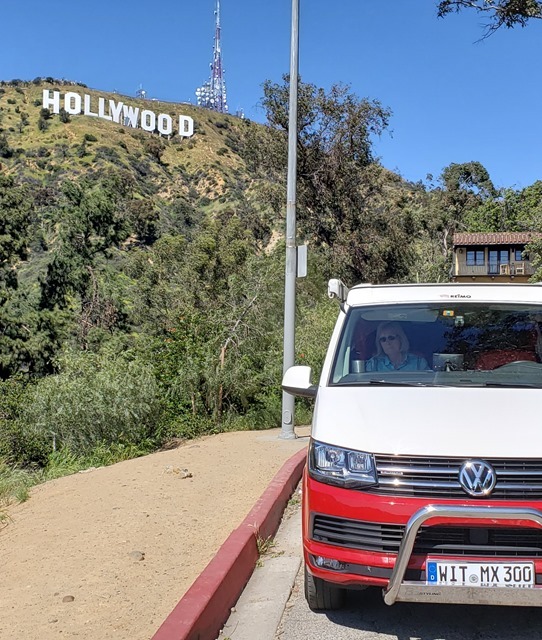 Since we’re not really into big cities like L. A., don’t care to watch the walls around the houses of celebrities and couldn´t go on a Studio Tour with Harpo, I suggested to take a photo in front of the Hollywood sign in Griffiths Park. That was easily said but turned out to quiet an ordeal. In Griffith Park you cannot take the car all the way to the sign. Which leaves you with what, a stupid selfie with with the Hollywood sign in the background? Well, we tried another way to approach the sign. 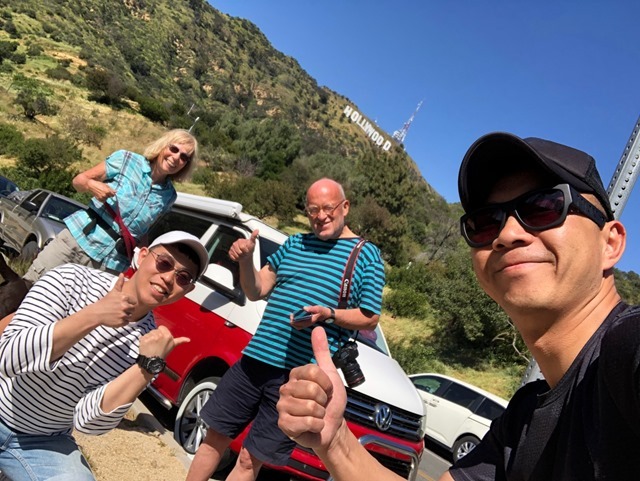 In Google Maps there is a Hollywood Sign viewpoint in Lake Hollywood Park and that is where we went. A steep narrrow road which reminded me of the roads to the top in Nice, France took us up the hill, along nice homes with German cars in the driveway, which is always a sign of good taste. When we finally arrived we were greeted by two young men who introduced themselves as Lai and his friend from Taiwan. If they could take a selfie with the van. They said they had almost the same car back home in Taiwan and so they would have liked to take a picture. In the end we took stupid selfies with the Hollywood sign in the background without end – and enjoyed it, too. We took the Santa Monica Boulevard out of Hollywood and headed for Malibu. Parking overnight is difficult in Los Angeles. We usually check out our apps to look for a nice place but in this city most parkings are closed for the night. So we ended up in Malibu by the sea with a wonderful view over the Pacific Ocean. The surf is almost louder than the cars passing by and so we are all set for the night.